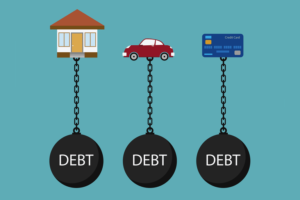 Do you think you have too much debt? Recognizing an issue early on will help you get things under control. I’m not really sure how much I owe. I can only afford to pay the minimum required payment due on my credit cards and other bills each month. The total amount of money I owe is not getting smaller over time. I frequently pay my bills late. I frequently juggle who and how much I pay each month. I am borrowing from one credit card to pay another. More than 20% of my income goes toward paying debt (other than my mortgage payment). I put off going to the doctor or dentist because I can’t afford it now. I spend more than I earn. I live from paycheck to paycheck and would be in a world of hurt if I lost my job or missed a paycheck. I borrow from family or friends and cannot pay them back. Track your expenses for a month. Look for ways to reduce. Leave your credit card home. Set up a plan a repayment plan with your creditors. They’ll appreciate the commitment! Seek financial counseling. Some non-profits offer free debt management and can help you set up repayment plans and write to your creditors. For one-on-one counseling, you can contact the National Foundation for Consumer Credit at nfcc.org or the Association of Independent Consumer Credit Counseling at www.alcca.org.